The international squads are the Ireland Holdsworth Pro Racing setup, the Belgian National Team, Britain Canyon Eisberg, Britain Saint Piran Elite Cycling Team, Britain Team KTM, Germany Bike Aid, Netherlands Delta Cycling X, Switzerland National Team, USA CCB Foundation – Sicleri, USA Jelly Belly p/b Maxxis and the Wales Racing Academy. The race will feature 19 Irish county teams, namely Cycling Leinster, Antrim Velo Café Magasin, Cork Blarney RC, Cork Strata3/Velorevolution, Dublin Friends First St. Tiernan’s, Dublin Lucan PDM, Dublin Scott Orwell Wheelers, Dublin Team Gerard DHL, Dublin UCD FitzCycles, Galway Gerry McVeigh Cars – DoorMotion, Kerry Killarney, Kerry Tralee Manor West, Longford Outdoor Escape Bike Shop, Louth Jons/Scme/Glen Dimplex, Mayo Ballina Molloys Pharmacies, Mayo Castlebar Unit 7, Tipperary Collins Cycle Centre, Tipperary Panduit and Westmeath Viner-Caremark-Pactimo. Those squads include the riders who were first and second in last weekend’s Shay Elliott Memorial, Ronan McLaughlin and Matteo Cigala (Westmeath Viner-Caremark-Pactimo), their teammate Conor Hennebry, who won the Kerry Group Rás Mumhan in April and leads the Cycling Ireland A1 rider rankings, and Lindsay Watson (Antrim Velo Café Magasin), who is second in the latter standings. “We are anticipating a really entertaining and hard-fought race,” says Rás organiser Eimear Dignam. “The international teams include some very strong riders, as does the Irish national team, but the county teams will line out with every intention of taking the fight to them. “Those county riders are extremely important to the event. They have long been at the core of it, and even though the standard of the race has increased since it became part of the UCI’s world rankings, they still turn out in droves. 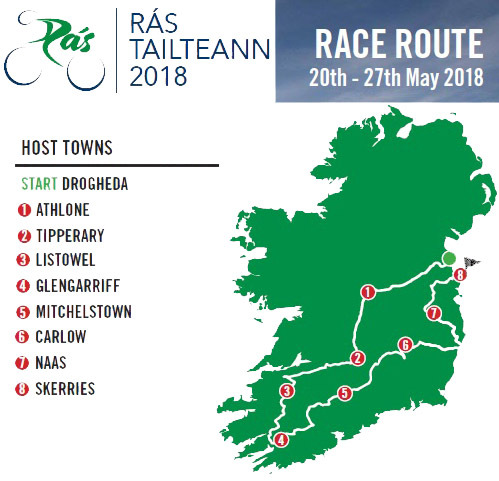 “The Rás Tailteann is unique in that it features a huge mix of experience, in terms of the type of racing its competitors have done before, yet every rider will start aiming to leave their mark on the race. Whether it is the battle for the final yellow jersey, for a stage win or for the best county rider prizes, everyone has something to chase and as a result, the racing is amongst the most aggressive and unpredictable in world cycling. In all, 155 riders will line out in Drogheda this Sunday. The opening stage begins at noon will see a mixture of climbs and sprints along the 136 kilometres to Athlone. There are two category three ascents, and hot spot sprints at Rochfortbridge and Kilbeggan. Both of these will award time bonuses towards the general classification, and could well prove vital. Day two extends 148.7 kilometres from Athlone to Tipperary, and has the category two ascent of Bikepark just over an hour after the drop of the flag. Two category three climbs come later before a flat, fast run in to the finish. Day three is a mainly flat stage which will be very brisk. It extends 140.4 kilometres between Tipperary and Listowel, and will likely end in a bunch gallop. Stage four is one of the most difficult of the race, with eight climbs littered along the 153 kilometres between Listowel and Glengarriff. These include the second category climbs of Ladies View, Molls Gap and Garranes, plus the first category Healy Pass. The slopes are guaranteed to fragment the bunch and cause chaos, while 25 mainly flat kilometres to the finish could see a regrouping of sorts. Stage five covers a flatter 150.2 kilometres from Glengarriff to Mitchelstown, although early on there will be the category two ascents of the Pass of Keimaneigh and Gortnabinna, plus a later category three climb near the finish. Day six could be better suited to those who want to break things up. The 154.6 kilometre stage from Mitchelstown to Carlow has no less than five climbs inside the final 50 kilometres, including first category Gorteen and then the second category Coan West and Clongrennan ascents. Stage seven from Carlow to Naas is even more difficult, with the 141 kilometre leg through Wicklow dotted with eight climbs. These are Ballythomas Hill (category two), Mondlea, Annagh Gap and Cronebeg (all category three), Garrymore (category two), Drumgoff, Wicklow Gap (both category one) and then the third category Slieve Cruagh. There remains just one more day beyond that point, a 144.6 kilometre race from Naas to Skerries. The platforms for attacks will be five category three climbs, namely the Hill of Allen, Plukhimin, the Cross of the Cage and the two ascents of the Black Hills on the finishing circuit in Skerries. In all, the race will feature four gruelling category one climbs, 10 category two ascents plus 20 third category slopes, and will pitch specialist climbers against all-rounders. The profile is much hillier than recent years, with the 34 climbs considerably more than the 21 in 2015, 25 in 2016 and 21 last year.